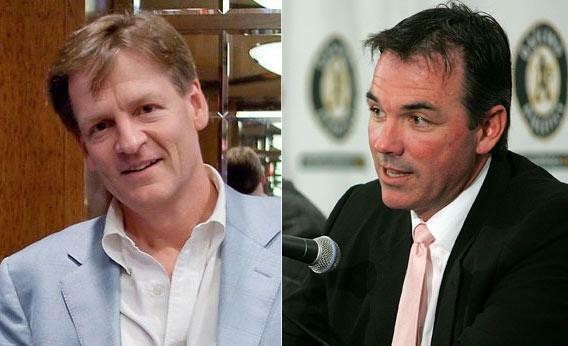 Author Michael Lewis and Oakland Athletics General Manager Billy Beane. Photograph of Michael Lewis by Justin Hoch. Photograph of Billy Beane by Justin Sullivan/Getty Images. The moment you see Michael Lewis and Billy Beane together, you realise how Moneyball: The Art of Winning an Unfair Game got written. The book that changed baseball—and then most other ballgames—isn’t so much a book. It’s more a conversation. This morning the writer and the baseball executive meet in the tumbledown Oakland Coliseum, where it all began, and pause only occasionally to answer a question. Most of the time they just continue their decade-old conversation. Lewis, who lives around the corner in Berkeley, noticed in about 2001 that something strange was going on at the Coliseum. The Oakland A’s baseball team were routinely beating teams with several times their budget. Clearly they must be doing something clever. The pre-eminent business writer of our times came to visit. The A’s’ general manager, Beane, let him in. He had read Lewis’s debut book Liar’s Poker, and he was curious. He cautiously told Lewis how the A’s were using new statistics to find good players ignored by other clubs. For instance, baseball teams had spent a century focused on a hitter’s “batting average”. It turned out that something called “on-base percentage” was much more telling. Beane was increasingly letting his twentysomething Harvard-educated statistician Paul DePodesta choose players on his laptop. The gnarled old A’s’ scouts didn’t like that. At 49, Beane still sports something of the Charles Atlas physique that once lured half the country’s baseball and football scouts to his parents’ house in San Diego. This morning he also sports a fresh coffee stain on his shirt, timed just right for the FT’s photo session, “because I’m me”. Lewis has an imperfectly tamed southern accent, a pink preppy shirt and an expensive watch befitting a journalist who reputedly earns $10 a word. We settle into one of the Coliseum’s poky offices—Bulgarian ministry of transport, c1976—and they reminisce about how they met. “It was in spring training of ’02,” says Lewis, whose articulacy will drive the conversation. “A newspaper article,” adds Beane. “I was never a great character,” puts in Beane. “Modesto, we drove,” says Beane. Beane’s life since—his compulsive reading, his discovery of the Moneyball system, his later discovery of soccer—is a long attempt to give himself the university education he never had. Just as Sergey Brin and Larry Page created Google partly because they went to Stanford, Beane created Moneyball partly because he didn’t. “His worst nightmare is that we all sit around talking about what makes him tick,” says Lewis, and then goes right ahead and talks about what makes Beane tick. “It was interesting to me when I met him that someone who had been denied the conventional college path had that hunger. He was reading all kinds of stuff, and kind of indiscriminately. He’s an omnivore: he eats badly and well, and he reads badly and well. “I would agree,” adds Beane quietly. Hang on: Lewis had a fancy education at Princeton and is still “agitated” about new things. Beane never fulfilled the teenage promise the scouts had wrongly seen in him. Perhaps he was too introspective, too self-questioning to succeed as a ballplayer. But he was always curious. Aged 27, a mediocre player for the A’s, he had done what no healthy 27-year-old major-leaguer ever does: he walked into front office and said he wanted to quit playing to become an advance scout. Just around that time, baseball was developing its own revolutionary intellectual movement: sabermetrics, rooted in the acronym SABR, which stands for the Society for American Baseball Research. The sabermetricians, a grouping of mostly odd-looking statisticians whose dean was Bill James, janitor in a pork-and-beans factory in Kansas, were very much outside professional baseball. When Beane became a scout, James was already a cult hero. He’d shown various age-old baseball strategies to be useless. Yet hardly anyone in professional baseball knew his name. Sabermetrics enchanted Beane. To this day he keeps some of James’s typewritten, mimeographed Baseball Abstracts in his office. “I’ll never throw them away,” he told me once. He quickly decided he wanted a sabermetrician of his own. In the film, Pitt and Jonah Hill (as the fat geeky statistician) capture the jock-nerd relationship well. It’s love, but it’s mutual. Hill is wowed by the alpha male Pitt, and Pitt loves Hill for his mind. Anyone in baseball could have pinched James’s ideas, but there are specific reasons—beyond Beane’s personal journey—why the A’s got there first. First, they had no money. As Pitt tells his scouts in the movie, “The problem we’re trying to solve is there are rich teams, and there are poor teams.” He pauses, before adding: “Then there is 50ft of crap, then there’s us.” The A’s needed to find talent cheap. Second, the Coliseum is just a traffic jam away from the US’s most innovative region. “We’re in the shadow of Silicon Valley here,” marvels Beane. It’s surely no coincidence that the hippies, the breakdown of the family, the high five (supposedly invented by the A’s player Glenn Burke), the personal computer, Google, the iPhone and Moneyball all came out of northern California. Hairless wonders like the young Lewis? “I wasn’t as bright as they were, but, yes, when I came out of the training programme at Salomon Brothers it was pretty clear I was going into the cutting-edge group filled with the people from MIT, as a lesser light, a salesman rather than a trader. To a degree, this happened. Today a laptop evaluates a player’s quality, and the scouts evaluate his personality. They are needed now for their soft skills. For years Moneyball worked for Oakland. The A’s won more games than they lost every season from 1999 to 2006. Their peak was 2002, the year Lewis hung around the Coliseum, when the unlikely bunch of rejects assembled by Beane won 64 per cent of their games. The movie’s emotional peak is their 20th successive victory. Does Beane really spend games listening to documentaries about history? “It was too late to do anything,” sighs Lewis. But the former ballplayers who then ran baseball were even more aghast. The notion that numbers could trump gut outraged them. Unfortunately for them, a year after the book appeared, the Boston Red Sox, with the 30-year-old Yale graduate Theo Epstein as general manager, won the world series of 2004 using Moneyball methods. In 2007 the Red Sox won again. Other teams began hiring Epsteins and Beanes rather than clubbable ex-players. Last season only three of 30 GMs in the major leagues had played professional baseball, none of them very successfully. Beane has ended up restricting job opportunities in baseball for people from backgrounds like Beane’s. There are two silly objections often made to Lewis’s book. The first is that if Moneyball works so well, then why haven’t the A’s had a winning season since 2006? We meet on a sunny October morning, mid-playoffs, a perfect day for baseball, but the team’s season has long since ended. However, the people who make this objection don’t seem to grasp the basic principles of imitation and catch-up. Once all teams are playing Moneyball, then playing Moneyball no longer gives you an edge. Indeed, the richer clubs have the means to play it smarter. The New York Yankees recently hired 21 statisticians, Beane marvels. At least books beget films. Ten years ago, Beane could not have foreseen that one day Brad Pitt would be sitting in the A’s changing room (which looks more like a junk room) eating pizza and trying to figure out Beane’s psyche. Pitt and his twins also visited Beane and his twins at home, much to the excitement of Beane’s wife and nanny. We chat about Moneyball’s inexorable spread through all sports. I tell him about the England cricket team’s recent victory in the Test series with India. England’s coach, Andy Flower, is a devotee of Moneyball. Before the series his statistician, Nathan “Numbers” Leamon, carried out a Moneyball-style analysis of India’s great batsman Sachin Tendulkar. “Numbers” discovered that Tendulkar struggles early in his innings to score runs on his “off side”—that is, when the ball is bowled on the side of his bat rather than his legs. In the 22 years that Tendulkar has played Test cricket, nobody had previously spotted this. England bowled to Tendulkar’s off side early in his innings, and repeatedly dismissed him cheaply. Beane is amazed that cricket has only just started doing this analysis. On the shelf behind him, he finds the A’s’ statistical file for their recent routine series against the Detroit Tigers. The file is perhaps 40 pages thick. Beane leafs to the pages for one of the Tigers’ batters, Alex Avila. A chart shows exactly how Avila has fared in each tiny section of his strike zone, and how that varies depending on the phase of his at-bat. The chart looks, as Beane likes to say, like a piece of analysis done at a hedge fund. That’s Moneyball. Beane puts the file away. He still likes this stuff, but there’s so much else to think about. He walks me to the car park, where he engages the friend who drove me here in a 15-minute conversation about growing up in San Diego.